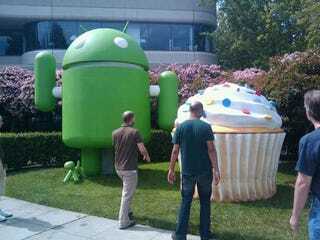 T-Mobile will start rolling out the long awaited 1.5 'Cupcake' update to all G1 users next week. The over-the air update should be available to everyone by the end of May. · An on screen full QWERTY keyboard. · Video record and playback capabilities. · Easy uploading of photos to Picasa and videos to YouTube. Additional details on Android 1.5 can be found at the T-Mobile G1 forum at http://forums.t-mobile.com/tmbl/?category.id=Android or via the Android site:http://www.android.com/releases/.